Pristine pocket map of Victorian London. Reynolds's Map of Modern London Divided into Quarter-Mile Sections for Measuring Distances. A pristine example of James Reynolds' 1662 pocket map of London, England. Covers the center of London from Notting Hill to the Isle of Dogs and from Kentish Town to Battersea Park. Details every street, parks, train station, bridge, monument, pier, and government building. Tourist destinations such as the Botanical Gardens, the Zoo, Buckingham Palace, the Tower of London, and the British Museum are highlighted in red. In addition to existing streets and buildings, Reynolds' also details a proposed embankment along the northern shore of the Thames from Westminster Bridge to Blackfriars Bridge. This eventually evolved into the Victoria Embankment, which was constructed roughly as proposed between 1865 and 1870. This map folds into its original linen binders and is accompanied by a short visitors guides features notes on exhibits, museums, and galleries as well as a street index and an assortment of advertisements. Reynolds first issued this map in 1857. It went through some thirty two subsequent editions eventually evolving into Smith's Tape Indicator Map of London. 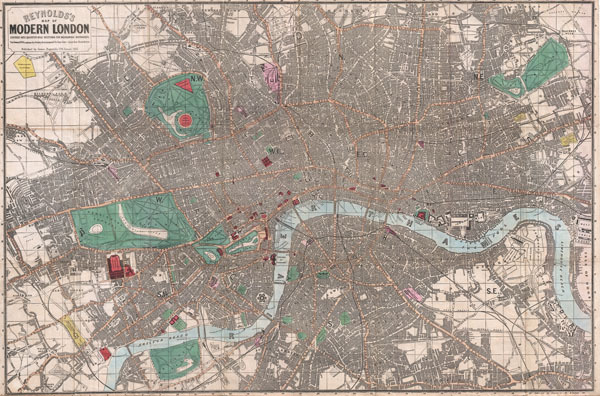 This edition, the sixth, is notable for its inclusion of the Victoria Embankment – a novelty given that work on the embankment did not begin until three years after this map was printed. James Reynolds (1817-1876) was a London based map and chart publisher active in the mid-19th century. Reynolds produced numerous maps and tourist guides of London and the surrounding areas as well as various astronomical and scientific charts. After Reynolds retired his sons, William Henry and Frederick, took over his business, updating and reprinting many of his maps and charts before selling the firm to Charles Smith in the late 19th century. Reynolds operated out of office at 174 Strand Street, London. Reynolds, J., Reynolds's Map of London and Visitors Guide, 1862. Very good notably pristine example. Light wear on original fold lines. Else very clean. Comes with original linen binder which contains a guide and gilt titling. Hyde, R., Printed Maps of Victorian London 1851 - 1900, No. 54 (6).